During a late afternoon ramble through the garden I noticed the simple dignity and beauty of this fading Clematis flower. For the most part I have been letting the plants die back naturally, leaving seed heads for the birds and winter interest. This suits my gardening style and is a good way to postpone cleanup chores until at least January. 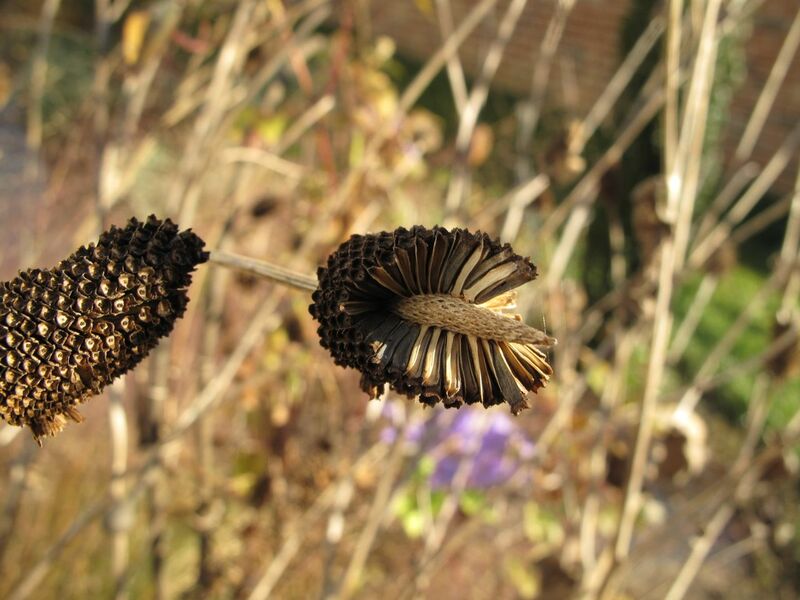 Four and five-foot stalks of Rudbeckia hirta ‘Irish Eyes’ criss-cross and lean along the southern side path, each topped with brown cones. 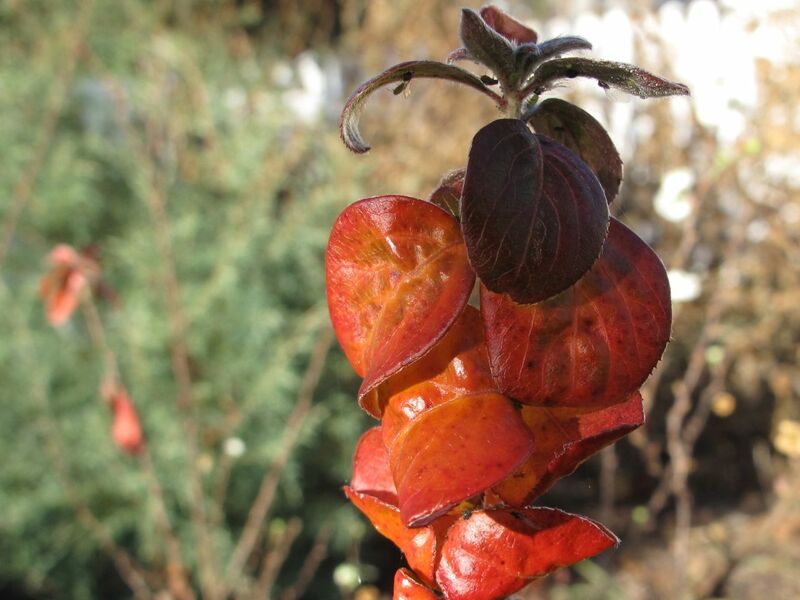 At the base its large leaves are in various stages of change. 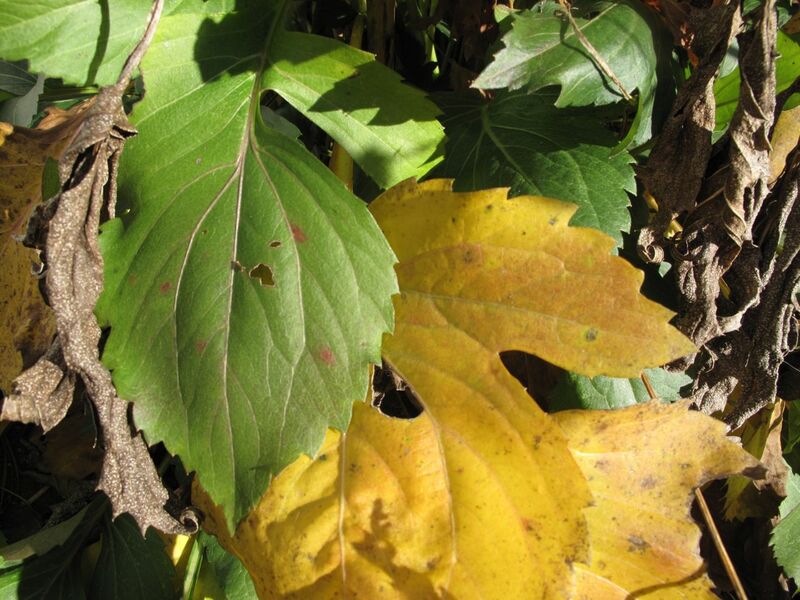 This fall there have been several brief periods of cold nights and a couple of hard frosts, but soon the weather warms again. A small Spiraea transplant, after experiencing this transition from cold to mild temperatures and detecting a similar amount of daylight as in spring, sent out a few more flowers this week, even as its leaves turned rich red-orange rust and rosewood. In many areas mounds of Aquilegia canadensis (Eastern red columbine) soften the garden at this time of year and fill the beds with soft greens, reds, yellows and burgundies. The cold temperatures have damaged many of the sasanqua blooms, but the shrubs are full of buds and continue to brighten the northeast corner of the house. Fifty-two degrees at 4:50 pm. Overcast most of the day. The sky was deep blue and clear during my garden walk but the sun was low and most of the garden had fallen into shadows. Chapel Hill and about two-thirds of the state are in a moderate drought with little chance of rain forecast. Temperatures will edge back up into the seventies by the weekend. This entry was posted in garden and tagged almanac, autumn blooms, autumn garden, Camellia, clematis, eastern red columbine, nature photography, photographing nature, Rudbeckia hirta 'Irish Eyes' on December 6, 2012 by pbmgarden. My pleasure Christina–I felt better about the way the garden looks once I examined it a bit more closely. 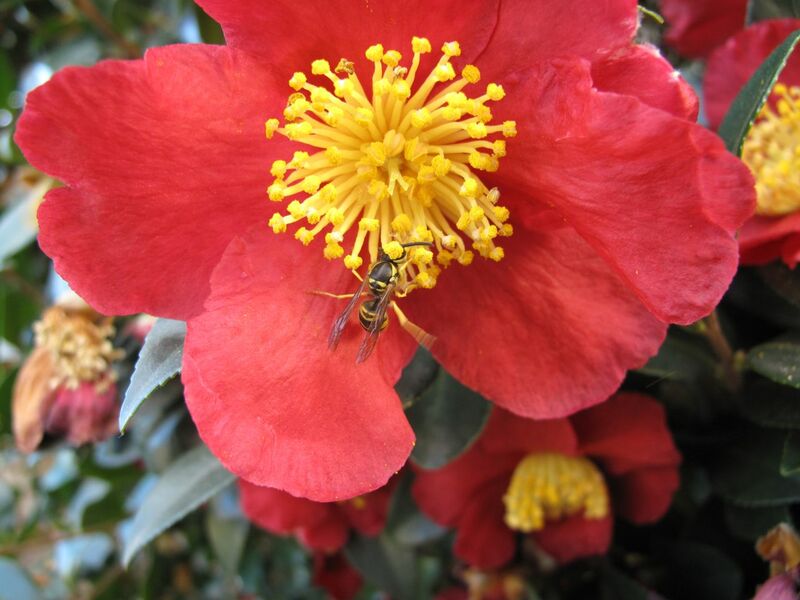 The camellia flowers are just wonderful Susie! 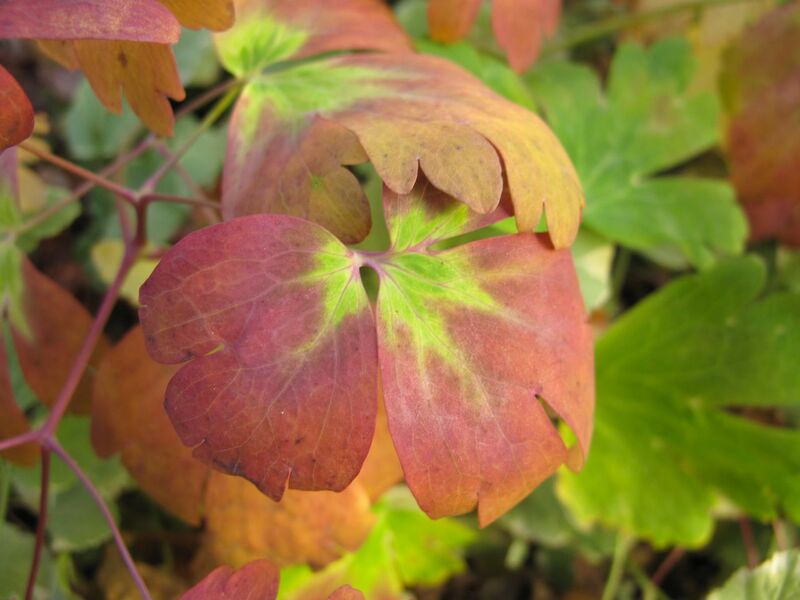 I love the shades of pink on the aquilegia leaves, and the seedheads are very pretty too. Well spotted. Some lovely shots which I enjoyed looking at. Thank you so much Malc! 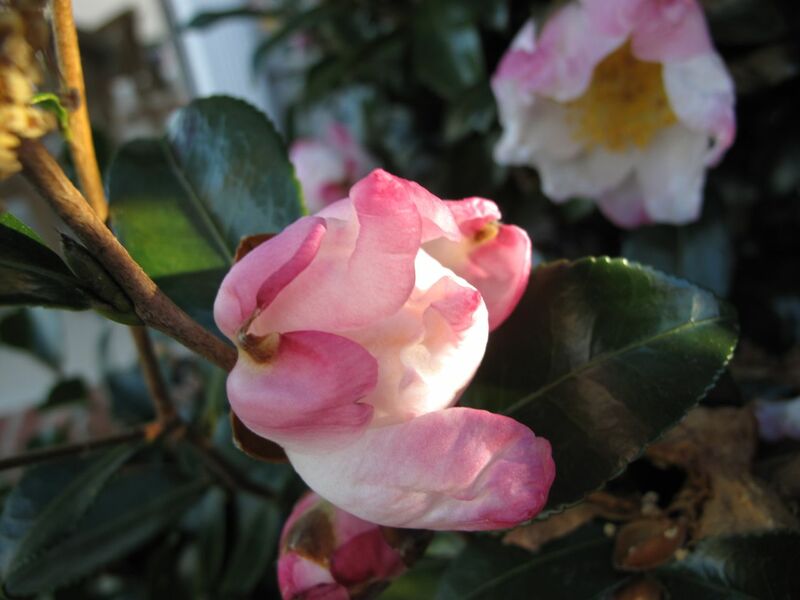 Such lovely Camellias, looks almost spring like! 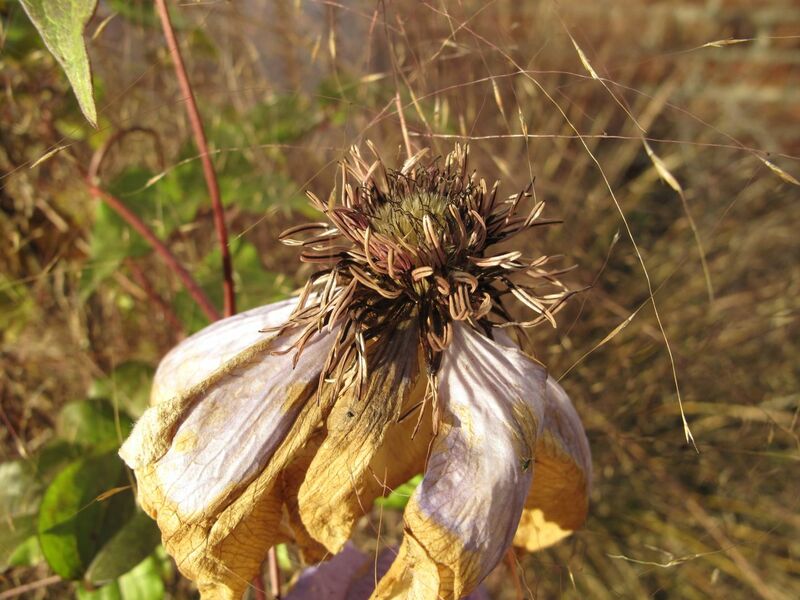 Your seedheads are making pretty patterns, beautiful even when they are dying, hope you still have some good gardening weather. Nice post and great photos! 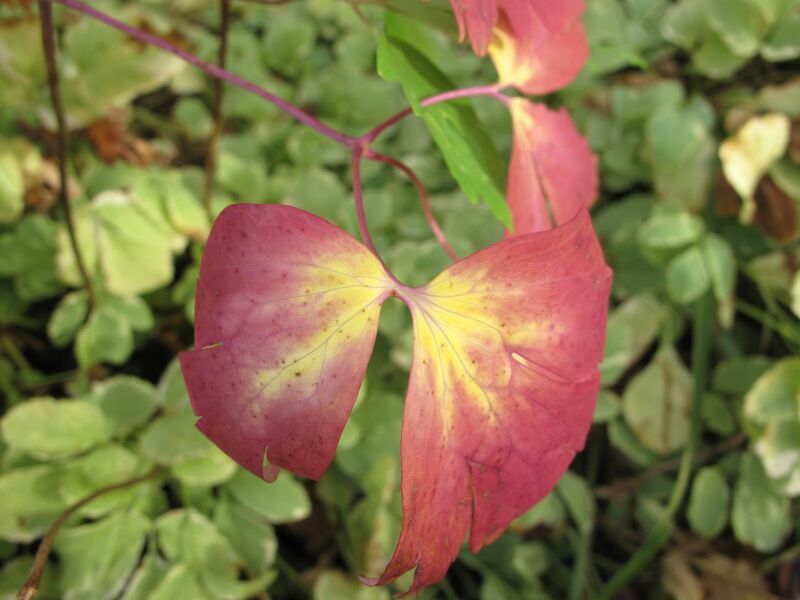 It’s true there is beauty in the most unexpected places – a philosophy I’ve had to adopt lest I go crazy in the harsh gardening climate of the ‘North’. We’ve had winter for almost 2 months now – it’s going to be long one! Thanks for your nice comments Sue! We don’t get much serious winter until after the new year and last winter was so mild everything bloomed a few weeks early. Who know what it will be like this year though. Hope your winter is lovely. I’ll look forward to reading about it. 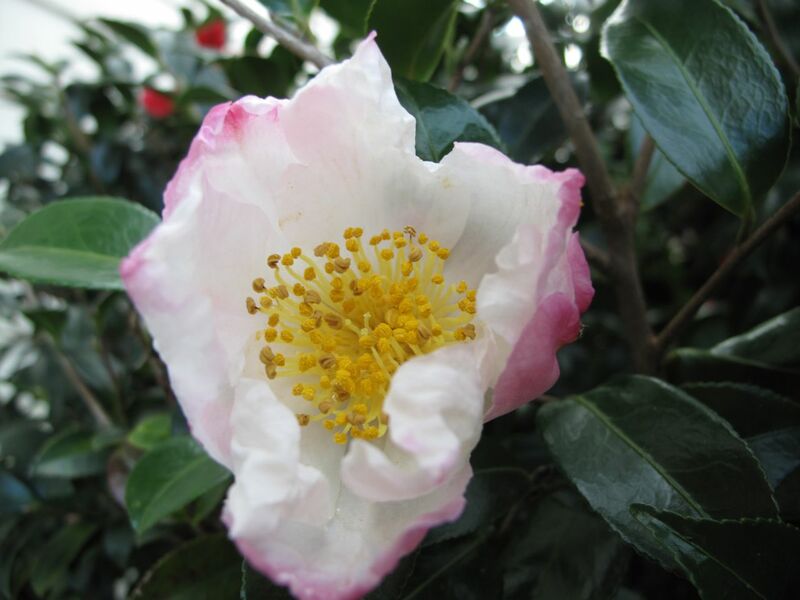 Love the Camellia sasanque ‘Yuletide’, such a lovely contrast of colors. Thank you for sharing. The snow falling effect is very nice, especially when the flakes fall over the leaves and petals. Thank you P&B–nice to hear from you. I’m grateful for the camellias right now. That snow is fun. 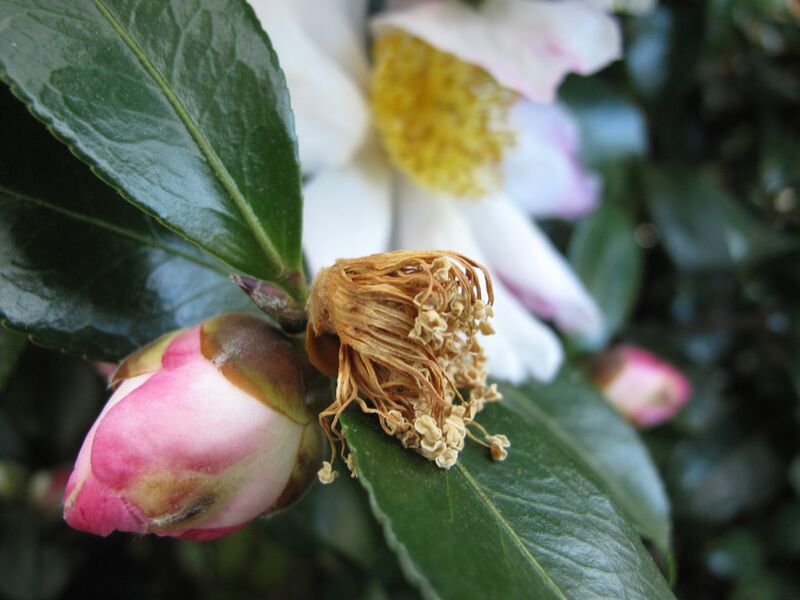 Your camellia photos are lovely especially the partially open crinkly white flower. You captured some treasures. Thanks very much Carolyn. I liked the crinkliness of that particular flower. I found this quote in a book I picked up at a used bookstore. “A photographer who wants to see, must recognize the value of the familiar. If you do not see what is around you every day, what will you see when you go to Tangiers?” I think you see very well. So nice! Thanks for sharing this quote with me. That clematis picture is amazing, I love it. 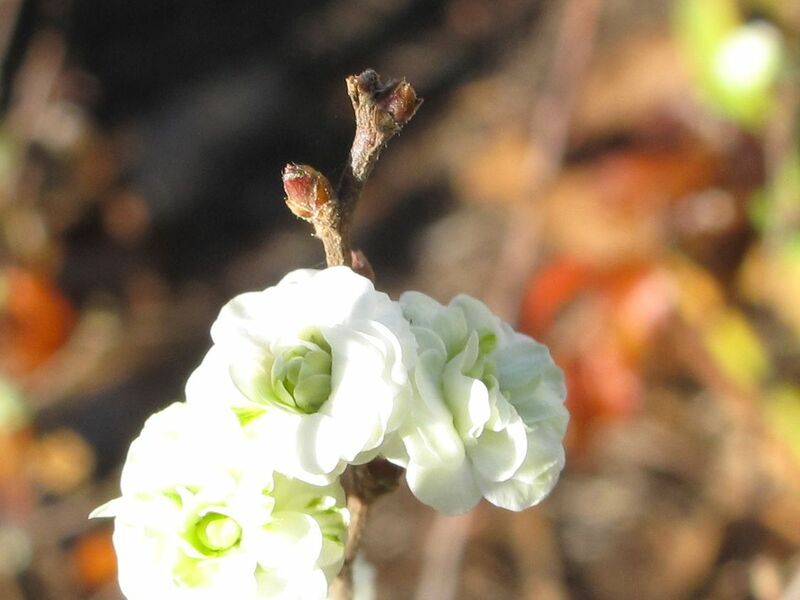 You have so much still going on in your garden, spirea in bloom… Crazy! Thanks Alberto. It’s fun to have a few things lingering at this time of year. The spirea is highly unseasonal though.